In our rapidly changing information society, the role of media companies such as TMG is becoming increasingly important. By excelling in our core activities, we can add value − not just for consumers, but for all stakeholders in our value chain and for society as a whole. TMG attaches great importance to regular consultation with stakeholders about the direction of the company. We are aware that we exert influence on our stakeholders and we, in turn, are interested in hearing our stakeholders' views and concerns. This input is used to adapt our strategy where necessary and to bring our annual plans up to date. The Executive Board and the management boards of our business units are involved in this process in a number of ways. TMG is in daily contact with various stakeholders, such as employees, consumers and advertisers. Through social media, our websites, publications, presentations and open days, relationships with these stakeholders are developed and maintained. For other stakeholders, there are targeted events and specific moments of contact, such as the shareholders' meetings, presentations and guided tours. 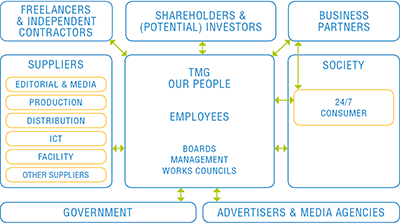 The overview below shows the main stakeholders in the context of TMG's value chain. Our main stakeholders, as shown in the Stakeholder dialogue overview, have a significant impact on or a significant interest in TMG. Regular contact is maintained with the government and institutions such as the tax authority with respect to the continuous developments at TMG. Relationships with local government bodies are maintained by the business units. Topics discussed during consultations with stakeholders in the reporting year include TMG's vision and strategy and the commercial implementation thereof, new collaboration opportunities, the media ecosystem and the company's ambitions with respect to corporate social responsibility. Focus on the future: ensure that the organisation and employees are agile and future proof. Identify talents, including talents that are not directly work-related. Be open and honest to customers with respect to privacy and also emphasise the advantages. Intensify the dialogue with suppliers and identify mutual points for improvement to further increase sustainability. Identification of material aspects is a continuously developing process. The main aspects in the area of corporate social responsibility were first identified in 2013 by means of a dialogue with multiple stakeholders. Based on our various structural dialogues with our main stakeholders (see Stakeholder dialogue overview), these aspects were assessed each year. This resulted in the specification of new aspects and prioritisation of aspects that both internal and external stakeholders consider to be important and also have an impact on TMG's performance. There has been no change in the manner in which TMG has drawn up the list of aspects. 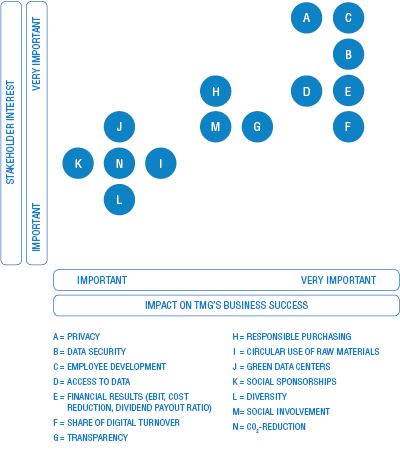 During this year's structural dialogues with experts, Investor Relations day and the dialogue with multiple stakeholders, a large number of stakeholders determined the current aspects with respect to corporate social responsibility, which resulted in the materiality matrix below. The material aspects are discussed with our main stakeholders at various moments and in a variety of ways. The Stakeholder dialogue overview below shows the form and frequency of and material aspects discussed during our dialogues with our main stakeholders. The material themes play a central role in this. The overview is not exhaustive and in many cases multiple stakeholders are present during the contact moments. The frequency of the consultations varies from daily to once a year. There is no one-to-one relationship between the second and third columns. The results-column includes references to the sections in this annual report in which the results achieved for each of the material aspects are presented. Transparency is one of our strategic corporate social responsibility themes. This integrated annual report is one of the ways in which we demonstrate this. In this report, we report on our strategic, financial and non-financial performance with the aim to provide our stakeholders insight into how we create value for them and strive to achieve sustainable returns. In our view, an integrated report provides our stakeholders information on our financial performance as well as our impact on employees, society and the environment. By explaining our financial and non-financial performance in relation to our strategy, external developments, risks, opportunities and governance, we aim to enable the stakeholders to obtain a holistic view of the media ecosystem in which we operate. To ensure transparent and integrated reporting, TMG follows the guidelines of the International Integrated Reporting Council (IIRC), which has developed a framework for this purpose. Tax Transparency Benchmark of the Dutch Association of Investors for Sustainable Development (Vereniging van Beleggers voor Duurzame Ontwikkeling, VBDO). TMG is responsible for the effects of the decision making processes and daily activities over which it formally and/or reasonably1exercises control. We are aware that, in addition to having responsibility, in some cases we also have the capability to influence the behaviour of certain stakeholders. These situations are part of TMG's sphere of influence. We, in turn, are interested in hearing our stakeholders' views and concerns and use this input to adapt our strategy where necessary, and to bring our annual plans up to date. In order to determine the highest ranking material aspects, we are in continuous contact with our stakeholders. Participants in the extensive stakeholder dialogue with multiple stakeholders during the reporting year constituted a diverse group consisting of suppliers, media agencies, shareholders, employees, social organisations, NGOs and consultants (also see the TMG stakeholders section). The material aspects that we have specified help us to present a well-balanced and complete picture of our performance in this annual report. The material aspects have been adopted by the Executive Board. This annual report relates to the period 1 January to 31 December 2016 and was published on April 3, 2017. The materiality analysis ensures that this annual report covers all material economic, social and ecological aspects. All entities of TMG in the Netherlands and abroad are included in the scope of this annual report. For more information on the scope of the financial performance we refer to the notes to the consolidated financial statements. TMG only reports on the non-financial performance of entities of which it has more than 50% ownership. As our radio activities have been placed with a new radio company of which TMG has less than 50% ownership, the financial and non-financial information on Sky Radio Group included in this annual report relates to the period up to and including 30 September 2016. The information does not relate to other stakeholders in the supply chain such as customers and suppliers. Depending on the aspect, our approach and performance are explained in the form of text or a referral to our policy or by providing data and a description of the progress that has been made with respect to any objectives. All financial data in this integrated annual report was derived from and is in accordance with our financial statements. The non-financial data in this annual report relates to Human Resources, quantitative customer data, reach, the environment and transparent business operations. Environmental data was provided by the Facilitating Services business unit, which it obtained from various registration systems. Information regarding customers and Human Resources was obtained from our business operations systems, in line with the data in our financial statements. Data relating to reach is based on official NOM figures and online data systems such as Google Analytics. Reach-related figures presented in this report are accompanied by clear references to the source from which the data was obtained. Other information on transparent business operations or corporate social responsibility in the broad sense was derived from our corporate social responsibility-related activities. The non-financial data was obtained from the responsible business entities and departments and has been compared with the comparative figures of previous years where possible. If estimated data is used, this is indicated clearly in the text. Estimates are based on either historical information or the extrapolation of data relating to the first ten or eleven months of the year. The plausibility of and movements in the data have been verified by the responsible officers. The non-financial information presented in this report has not been verified by an external party. At present, TMG gives priority to implementing sustainability initiatives within the organisation. The data presented in this annual report was calculated on the basis of data provided by the responsible business entities and departments. The plausibility of this data was verified by the responsible officers. TMG uses the up-to-date year-end well-to-wheel data provided by CO2emissiefactoren.nl for the calculation of carbon emissions. This website offers a uniform list of key figures on carbon emissions, which simplifies comparisons between organisations. The non-financial data included in this report has neither been audited nor subjected to any other form of assurance by the external auditor. We look forward to receiving your feedback on our annual report. Questions or remarks can be sent to concerncommunicatie@tmg.nl. Reasonably refers to situations in which TMG has the informal capability of influencing another party's decision making process or activities. This is a new target; information for 2015 is not available. This annual report is based on the fourth generation guidelines of the Global Reporting Initiative (GRI G4), which have been applied at core level. This means that reporting is based on GRI indicators that are material to TMG’s business operations. The GRI table below shows which GRI indicators have been included (GRI G4 indicator column) and where they can be found in this annual report. An explanation is provided about items that we do not report on. Statement from the most senior decision-maker of the organisation about the relevance of sustainability to the organisation and the organisation’s strategy. Primary brands, products and/or services. The number and names of countries where the organisation operates. The nature of ownership and legal form. The markets served (including geographic breakdown, sectors served, and types of customers and beneficiaries). The number of employees by gender and age. a) The number of employees by type of employment contract and gender. b) The number of employees with a permanent employement contract by employee category and gender. c) The total workforce by employees and supervised workers and by gender. d) The total workforce by region and gender. e) Percentage of the organisation’s work that is performed by workers who are legally recognised as self-employed, or by individuals other than employees or supervised workers, including employees and supervised employees of contractors. f) Significant variations in employment numbers (such as seasonal variations in employment in the tourism or agricultural industries). Our reporting structure is not yet designed to incorporate the exact distribution of data as mentioned under a, b and e. In our opinion, the other data does not increase the value of the report, or is irrelevant. Significant variations in employment numbers due to seasonal variations, for example, are not applicable to us. Percentage of total employees covered by a collective bargaining agreement. Description of the organisation’s supply chain. Any significant changes during the reporting period regarding the organisation’s size, structure, ownership, or its supply chain. Description of whether and how the precautionary approach or principle is addressed by the organisation. Externally developed economic, environmental and social charters, principles or other initiatives to which the organisation subscribes or which it endorses. Overview of all entities included in the organisation’s consolidated financial statements or equivalent documents. Overview of all entities included in the organisation’s consolidated financial statements or equivalent documents, but not in the GRI report. Explanation of how the organisation has implemented the GRI Reporting Principles for Defining Report Content. Overview of all the material aspects identified in the process for defining report content. Report on the aspect boundary within the organisation for material aspects. Report on the aspect boundary outside of the organisation for material aspects. The effect of any restatements of information provided in previous reports, and the reasons for such restatements. The basis for identification and selection of stakeholders with whom to engage. The organisation’s approach to stakeholder engagement, including frequency of engagement by type and by stakeholder group, and whether any of the engagement was undertaken specifically as part of the reporting process. The structure of our reporting process is not yet designed to involve all main stakeholder groups specifically in the context of our reporting. We aim to optimise the structure of this process to this end in the future. The key topics and concerns that have been raised through stakeholder engagement, and how the organisation has responded to those key topics and concerns, including through its reporting. The ‘in accordance’ option the organisation has chosen. The GRI Content Index for the chosen option. Reference to the External Assurance Report, if the report has been externally assured. GRI G4, application at core level. The non-financial data included in this report have not been audited by the external auditor (nor has any other external assurance taken place). It is our ambition that, in the future, the entire report will be audited by an external party. The organisation’s policy and current practice with regard to seeking external assurance for the report. The scope and basis of any external assurance provided, if not included in the assurance report accompanying the sustainability report. The relationship between the organisation and the assurance providers. Statement of whether the highest governance body or senior executives are involved in seeking assurance for the organisation’s sustainability report. Current practice is described; the other items do not apply. The governance structure of the organisation, including committees of the highest governance body. Identification of any committees responsible for decision-making on economic, environmental and social impacts. Processes for the highest governance body to ensure conflicts of interest are avoided, including a statement of whether conflicts of interest are disclosed to stakeholders. Description of the organisation’s values, principles, standards and norms of behaviour, such as codes of conduct and codes of ethics. Description of the internal and external mechanisms for reporting concerns about unethical or unlawful behaviour, and matters related to organisational integrity, such as escalation through line management, whistleblowing mechanisms or hotlines. Description of why the aspect is material and the impacts that make this aspect material. Description of how the organisation manages the material aspect or its impacts. Evaluation of the management approach. Direct greenhouse gas emissions (Scope 1). Indirect greenhouse gas emissions (Scope 2). Other indirect greenhouse gas emissions (Scope 3). Significant environmental impacts of transporting products and other goods and materials for the organisation’s operations, and transporting members of the workforce. See section Responsible procurement. The percentage of the centrally contracted suppliers who have signed the Code of Conduct for Suppliers is available. During the reporting year, the foundation was laid for providing more detailed information. With regard to employee turnover, we do not yet report separately by age group, gender and region. Type of injury and rates of injury, occupational diseases, lost days, absenteeism, and total number of work-related fatalities, by region and by gender. At central level, only absenteeism rates and work-related injuries are available. Percentage of new suppliers that were screened using human rights criteria. See section Privacy. Numbers have been reported to the relevant institutions. Methodology for assessing and monitoring adherence to content creation values. See section Responsible content creation. Actions taken to improve performance in relation to content dissemination issues (accessibility and protection of vulnerable audiences and informed decision making) and results obtained. Number and nature of responses (feedback/complaints) related to content dissemination, including protection of vulnerable audiences and informed decision making and accessibility, and procedures for addressing these responses. An independent non-profit organisation that aims for systematic changes in market behaviour to oppose climate change, water shortages and deforestation. To this end, CDP facilitates a global system that enables companies, cities, countries and regions to publicise and control their impact on the environment. For more information, see: http://www.cdp.net. CertiQ certifies renewable solar, water, wind and biomass energy. CertiQ has been appointed for this task by the Dutch government. The Certificates of Origin issued electronically by CertiQ and are the only valid proof in the Netherlands that the energy to which they relate is generated sustainably. Certificates issued by CertiQ can be traded within Europe. For more information, see: https://www.certiq.nl. Striving for optimal high-value reuse of raw materials. De lijst CO2-emissiefactoren is het initiatief van SKAO, Stichting Stimular, Connekt, Milieu Centraal en het ministerie van Infrastructuur en Milieu en is tot stand gekomen in samenwerking met diverse belanghebbenden naar aanleiding van een Green Deal met de betrokken partijen. Voor meer informatie zie: https://www.co2emissiefactoren.nl. Reduction of TMG's scope 1 and 2 CO2 emissions (office buildings, printing plants and in-house-managed transportation). Ensuring that the group of people working at and with TMG forms a representative reflection of society. Dividend as a percentage of total profit. Earnings before Interest and Tax is a standard to measure a firm's operating income before deduction of interest and tax. EBIT is equal to the revenue minus the costs incurred as a result of normal business operations, excluding financial income and expenses and tax. Earnings before Interest, Taxes, Depreciation and Amortisation (EBITDA) is a standard to measure result development. EBITDA is the operating result excluding depreciation, amortisation and impairment. Offering employees possibilities for personal development and skill training. A tool for implementing energy efficiency improvement measures as part of companies' internal planning process. The plan identifies which measures will be implemented when. It is a mandatory element of a company's long-term agreements on energy efficiency. The Forest Stewardship Council (FSC) is an international organisation dedicated to preservation and responsible forest stewardship throughout the world. FSC defines responsible forest stewardship as the balanced weighing of the ecological, social and economic aspects of forest management. For more information, see: http://www.fsc.nl. Reduction of the environmental impact of the data centres used by TMG for hosting online products. An international standard for measuring, calculating and reporting the emission of greenhouse gases. For more information, see: https://www.ghgprotocol.org/. The Global Reporting Initiative (GRI) aims for sustainability reporting by all organisations. GRI produces the world’s most comprehensive Sustainability Reporting Framework as a means of effecting greater transparency by organisations. For more information see: https://www.globalreporting.org. Het Oplage Instituut (HOI) is Dutch for The Circulation Institute, which collects, verifies and publishes circulation figures for media published in the Netherlands. On 1 January 2015, it was acquired by the national multimedia research foundation NOM. International Integrated Reporting Council. An international coalition that facilitates and monitors the Integrated Reporting framework. For more information, see: integratedreporting.org. The set of preventive, detective, repressive and corrective measures, procedures and processes that guarantee the availability, exclusivity and integrity of all forms of information at TMG with the aim to ensure the continuity of the information and information supply and limit the possible consequences of security incidents to an acceptable predefined level. The International Labour Organization is a specialised United Nations organisation. The promotion of social justice in work-related situations is one of the ILO’s most important objectives. For more information, see: http://www.ilo.org. Non-government organisations (NGO's) are organisations that operate independently from the government and address causes that are considered to be in the interest of society. NOBO, carried out by Kantar TNS, became the new standard in digital reach assessments in 2016. NOBO is a partnership in which more than twenty large media companies participate. Nationaal Onderzoek Multimedia (National Multimedia Research foundation) (see HOI). The hosting of online products developed in-house by TMG. This relates to hosting at qualified data centres contracted by TMG as a product/service for the housing of physical server infrastructure. Data centres that are used by suppliers as a non-specified part of contracted managed LaaS, PaaS and SaaS cloud services are not included in this scope. With respect to these data centres it is possible, in general, to specify the region from which a cloud service is delivered, but not the specific data centre or centres nor the specific servers. Over The Top (OTT) refers to content on the internet that can be accessed by anybody, independently from a distributor. The term is mainly use in connection with video. Paper that is guaranteed to originate from a sustainably managed forest as it is certified in accordance with PEFC, FSC or an equivalent standard. The Programme for the Endorsement of Forest Certification schemes is a global non-profit, independent quality mark designed to promote sustainable forest management. For more information, see: http://pefcnederland.nl. Details that provide information on an identifiable natural person as described in the Dutch Personal Data Protection Act (Wet bescherming persoonsgegevens). The right to privacy includes retaining control over one's personal details. Power Usage Effectiveness is a value used by data centres to determine their energy efficiency. Non-financial customer-related data such as number of subscriptions, single-copy sales figures, advertisements, circulation figures, etcetera. In addition to price, the procurement policy also takes into account the impact of purchased goods and services on the environment and society. In addition to the social engagement from a journalistic point of view that is part of daily business at many of our brands, TMG also devotes time, knowledge and attention to people and organisations that voluntarily contribute to society. Examples include charitable efforts of TMG employees and special focus placed on a specific social topic by one of our brands. Providing support to charities, social initiatives and non-profit events in the form of money or media attention. Improving the insight in the choices made by TMG and the carefully weighed possible consequences. The Transparency Benchmark is an annual assessment of the content and quality of corporate social responsibility reporting by Dutch companies. An initiative of the United Nations in which governments, the business community and various kinds of institutions collaborate to develop and apply universal principles concerning human rights, labour conditions, the environment and the combat of corruption. For more information, see: https://www.unglobalcompact.org.